Home » Jaydee Custom S.G. This instrument was built in Birmingham, England by John Diggins, now Jaydee Custom Guitars. The exact date of its manufacture is not recorded (or remembered! ), but will certainly be between 1975 and 1978. 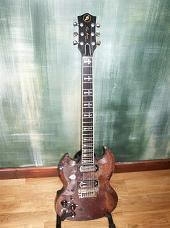 The guitar was first used for some overdubs on the ‘Heaven and Hell’ album. It was then used more and more frequently and soon took over from the black John Birch S.G. as the main instrument both on the road and in the studio. There is a pickup selector switch and five control knobs on the front of the instrument, though only three are wired in. All of Tony’s road guitars have the bridge pick up tone control disconnected. The fifth control was connected to a booster circuit, which has been removed. 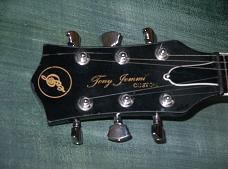 There is also an additional ¼” jack socket on the front of the guitar. This was originally a low impedance output for recording purposes, but has subsequently been disconnected. 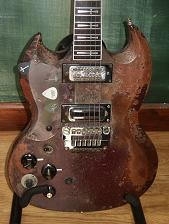 The very ‘distressed’ look of the guitar is due to a couple of factors. It was built on John Diggins’s kitchen table and had to be finished very quickly. As a result, the coats of paint and finish did not have the time to cure properly. At a later date the guitar was left in a car in an extremely hot part of the world and a lot of the finish bubbled up, giving the guitar the look that has become familiar to all Sabbath guitar fans. On tour, this is the main instrument for the ‘one step down’ D# tuning. It would be interesting to know Tony’s string action and neck relief specs on the old and new Jaydees, and the Gibson Custom Shop SG. The last bit about the tuning is incorrect. If it were a full step down it would be tuned to the key of “D”, however this is not correct either. It is actually tuned to drop D♭. Which is everything tuned 1/2 step down and the bottom E String (the thickest string) tuned a full step down from that. This makes the 2 bottom strings form a 5th chord when played open that will instantly give you that low end needed for Master of Reality, Vol. 4 and Sabbath Bloody Sabbath albums. With the notable exception of Tomorrow’s Dream which is recorded 1/4 step too high for some reason. I’ve just ordered one from Jaydee, 16 months waiting list but cannot wait.